Stephen Miller (South Miami) - Book Appointment Online! 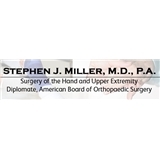 Welcome to the office of Dr. Stephen J. Miller, MD, PA. Dr. Miller specializes in the treament of the hand and upper extremity. He has been practicing in Miami since 1998. Dr. Miller is an extremely dedicated physician who prides himself on excellence in patient care. He personally treats all of his patients from the initial visit through discharge. He places importance on being accessible to his patients and making sure that they understand their diagnosis and treatment options. He takes the time to answer all questions and address all concerns. Dr. Miller employs a friendly and capable staff committed to excellence in patient service.